Pinewood’s unique design is unlike any other in Minnesota. With its elegant yet simplistic style, it fits nestled in a forest of towering pines. We also designed this building with the nature in mind. It was our goal to have as many windows as possible in an effort to bring the outside in. These suites were specifically separated between the first and second floors to ensure privacy for the bride and groom to get ready, without having to cross paths. Both of our executive suites include a full functioning kitchenette, private bathrooms, dressing rooms, and living areas. The suite upstairs also has a large makeup counter with seating and mirrors for multiple people to get ready for the day. Our outdoor ceremony area is truly amazing! 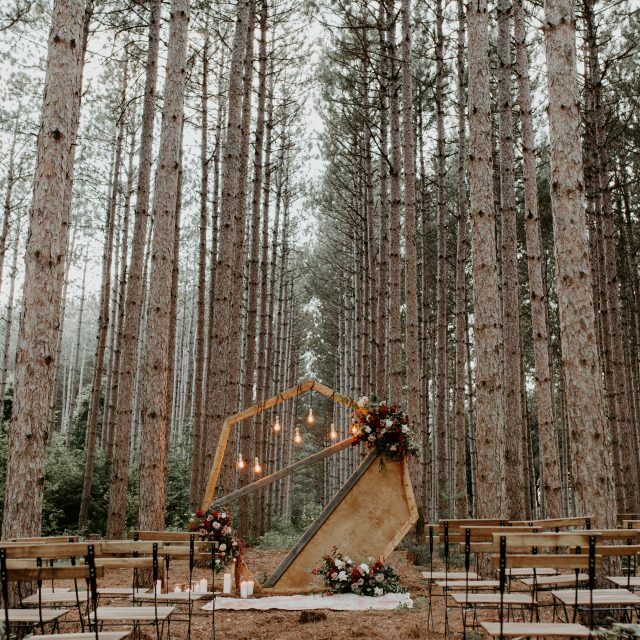 Nestled in the middle of towering pines, this is a perfect spot for an outdoor ceremony. We will be incorporating permanent benches at the ceremony site. If you decide to host your ceremony indoors, we have dedicated a beautiful, vaulted indoor space specifically for this use! 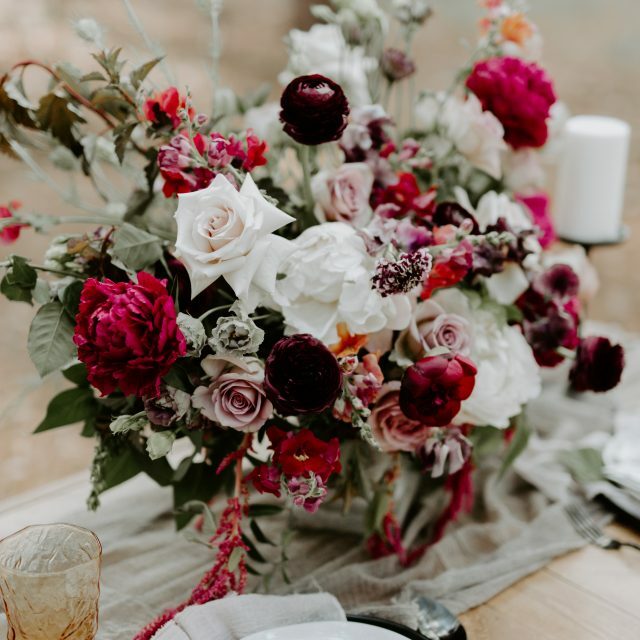 If you choose to do an outdoor ceremony and the weather is not working in your favor, our large ceremony room on the second floor of our building will be a stress-free backup for you! This room is separate from our reception hall on the first floor so your vendors never have to rush to flip the room for dinner. Outdoor or indoor- either option is truly a win-win! A custom designed bar in the reception area that allows service both indoors and out will be a big hit for our clients and their guests. Large patio area with access to the indoor/outdoor bar, outdoor firepit, and permanently mounted outdoor heaters for those chilly nights, all complimentary of Pinewood! 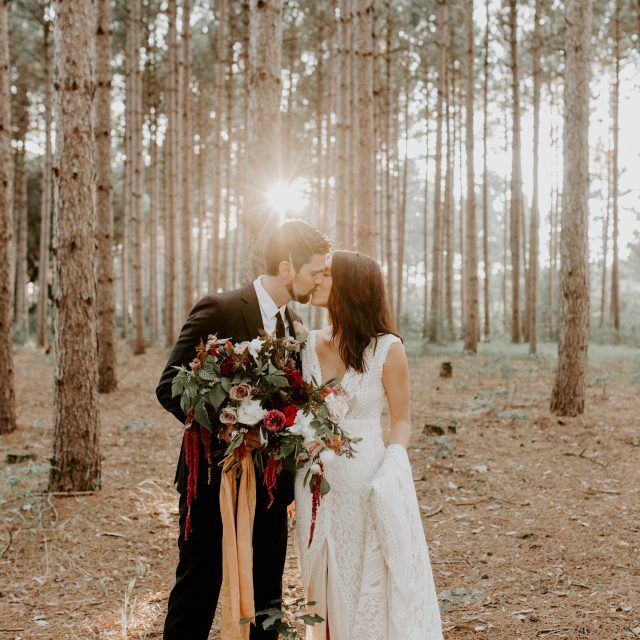 Lighting is extremely important for wedding couples because it allows their photographers and videographers to capture the most special day of their lives without any complications. We’ve specifically designed our building to allow as much natural light in as possible including floor to ceiling windows and nice light walls. On the first floor there is a welcoming, spacious gathering area for our guests to arrive and feel right at home. It features a seating area with a fireplace feature anchoring the room and a dominating two story glass wall in the front of the building so you can enjoy nature from inside. We provide tables and chairs for all of your guests for ceremony and reception. For an outdoor ceremony, there will be permanent benches built into the landscaping outside. For an indoor ceremony and reception, separate furnishings will be provided in each rooms, so there will never be a need for a room flip, or moving chairs. There will be plenty of parking in our private parking lot located onsite. We will also have handicapped parking to accommodate those who need it. We have handicap parking spaces, bathrooms, and an elevator to access the 2nd floor. Our bathrooms will be over-sized and have high end finishes to ensure you and your guests are comfortable during your event. On the first floor there are three 14 foot premium patio doors. These doors allow an ample amount of natural light into the reception area and also provide an indoor/outdoor space for our guests to enjoy the comforts of indoors with the beauty of nature, all at the same time. We are prepared for whatever Mother Nature brings our way! Our building is state of the art when it comes to climate control. Whether it’s the hottest days of summer or coldest of winter, we have you covered. Our building has commercial heating and cooling systems to keep you and your guests comfortable under any circumstance. Lastly, the entire property to explore!